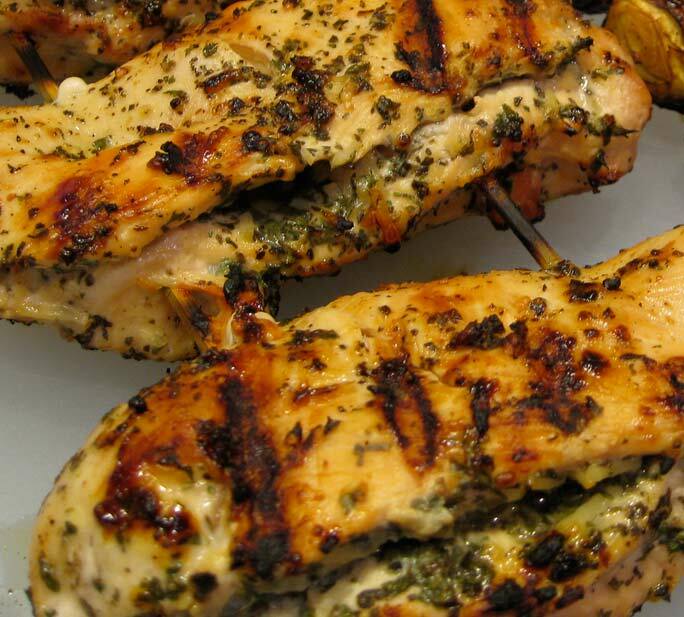 If you like pesto chicken, you will love this recipe. This may seem like a lot of pesto to make for just four chicken breasts, but you are making three separate pesto stations: marinating, stuffing, and saucing each breast. This method is well worth it and the leftovers are even better. In a food processor, combine basil, 1/2 Cup oil, garlic, lemon juice, and 3/4 teaspoon of salt and process until smooth. Remove 1/4 Cup of pesto and reserve for marinating the chicken. Add the Parmesan cheese to the pesto in the processor and pulse until incorporated. Remove another 1/4 Cup from the processor and reserve this for stuffing the chicken. Reserve the remaining pesto for saucing the chicken. Starting on the thick side of the breast, closest to the bone, cut a horizontal pocket in each breast, stopping 1/2 inch from the edge so the halves remain together. Place 1 Tablespoon of Parmesan pesto reserved for stuffing into each pocket of each breast. Evenly space kitchen twine beneath each breast and tie to secure each pocket closed. Place the stuffed breasts in a bowl and rub the pesto reserved for marinating all over the chicken, cover and marinate for 1 hour. Heat the grill to 350 degrees. Oil the cooking grates, and place the chickens on the freshly oiled grates. Cover and cook until the chicken registers 160 degrees (25-30 minutes). Flip the chickens and cook until they register 160 degrees (5-10 minutes). To serve, remove the twine and carve the chicken from the bone. Toss the argugala into the tomato salad and enjoy. 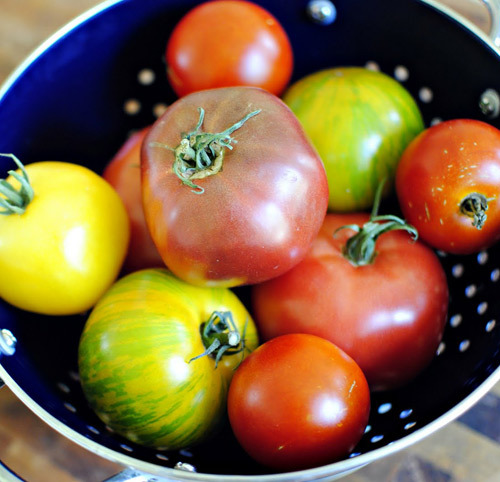 Combine the tomatoes, onions, vinegar, salt and pepper in a bowl and let it sit until ready to eat. Only add the arugala just before serving. This entry was posted in Chicken, Entrees and tagged basil, grilled chicken, heirloom tomatoes, herb chicken, metabolic diet recipes, pesto, pesto chicken, tomatoes by foodies4mmc. Bookmark the permalink. This recipe is excellent. If you can get heirloom tomatoes, it makes all the difference.